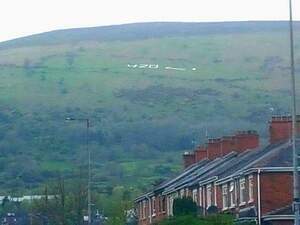 Pot exponents mark 420 with a pipe and a gentle demo called ‘Clouds In The Garden’ in favour of the legalisation of cannabis on medical and craic grounds. Posted in Misc and tagged 420, Legalise Cannabis at 4:38 pm on April 20, 2017 by Broadsheet. Mainly craic grounds though. Those boys are not interested in medical freedom. Although the chap with the shades MIGHT have cataracts, in fairness. I’ve never seen a hoodie worn over a hoodie before, is that a new thing? Let me introduce you to a little decade we like to call the 90s. I’ve never owned a hoodie tbh. there may have also been a brown suede box jacket around then but the less said about that the better. 501s. First time I found denims that were long enough coz they were for the menz. Game-changer. The 90s, man. Awesome. You were the very height of kool/cool. Jaysus, weren’t they a brand? I recall a tshirt or something from my youth. Are you thinking of Kangol? Looks really medical to me. 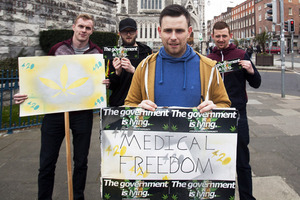 I’m going to go out on a limb and suggest that, despite holding the signs, these lads just want weed legalised – not for medical use. No, they want it legalised for recreational use but kept illegal for medical use. It’ll never happen in Ireland within the next 15 years. Too conservative a country. Politicians don’t want to rock the boat, ever! If cannabis, or any extract of it, is of medical value it should be managed and approved for patients. But it shouldn’t be legalised for junkies to blaze up a doobie/smoke the devil’s asparagus/brew the long dry magic teabag. Cool, so we’ll ban wine and beer because of alcoholics as well, yeah? People won’t stand for it. They get upset when the pubs close on Good Friday. That’s an odd way to make policy. Do you drink? I imbibe the devil’s buttermilk. Yes. If it wasn’t legal, I wouldn’t. There are, however, plenty who would. As if, you seem like a total ejit or a troll NewsJustin. You need a smoke of a big fat bifty, might give you some cop on. Would you vote to make alcohol illegal? Also; “If it wasn’t legal, I wouldn’t.”, you’ve a bizarre moral compass. What’s right and wrong is whatever you’re told it is, is it? Of course not, that’s a cop out. You see people who smoke weed as ‘junkies’, a dehumanising term and “scumbags” even though you ALSO take a mind altering substance….but you won’t hypothetically call for it to be banned because “people won’t stand for it”. You’re all over the place. It does belie the thought processes of the more oppressive moraliser like you, though. You have no interest in morals and principles beyond using them as a cloak for your feelings. You don’t want to admit, possibly to yourself, that you’re only interested in banning stuff you find personally icky so you pretend it’s out of concern for others and whip out lies like ‘if you smoke weed, you’re funding violence’. If you weren’t so consistent for so long, I’d swear you were a wind up troll because you hit so many clichés it’s unreal. Come on Moyest. Buying illegal drugs is, very obviously, funding organised, violent crime. That’s indisputable. That’s what makes people scumbags. Not smoking weed. And the can be outwardly very “respectable” scumbags. Indisputable? So you’ll have no problem proving that false statement. Further down the thread, you said this, remember? ; “Some who grow are just criminals. Not necessarily violent or organised criminals.” You’re all over the place. Let’s have that proof so. Alchohol is a far more dangerous drug and thats legal. By your logic alchohol should only be sold to non-alchoholics. How do we do that? I think he wants it banned for *everyone* because he’s offended at the sight of Undesirables enjoying things. Junkies are smoking weed now? That’s fantastic news, to be fair. Good for them. It’s almost as if the English speaking world have been manipulated with a false narrative about societal politics. It’s far from “virtually drug free”. That report claims nothing of the sort. How drugged up is it then? The portuguese approach is a great one and I’d be in favor of going the same way here (and everywhere) but don’t make out like there’s no drug problem whatsoever there. Nah, it will happen by 2020! and unlike USA, Lithuania and Mozambique – where politicians want to rock the boat only 61% of the time. Why is it illegal for an adult to possess cannabis? It seems relatively benign compared to a lot of acceptable/legal things that are actively encouraged..
From this thread; “But it shouldn’t be legalised for junkies to blaze up a doobie” People need to feel superior so that’s why I can’t grow a plant in my bedroom. Well it’s a little chicken and egg, but at the moment, if you’re in possession of cannibas today, you’ve probably funded organised crime to get it. I understand that legalising it could change that but, as of today, most people buying illegal drugs are funding violent crime, so they’re scumbags who should be charged. I’ll grow my own eggs so. Dude, that’s incredibly horsh. Scumbags? Really? You’re not going to win any argument with that kind of rhetoric. Some who grow are just criminals. Not necessarily violent or organised criminals. You don’t even know if it’s most. I’ve seen more than one large greenhouse owned by very non violent people. 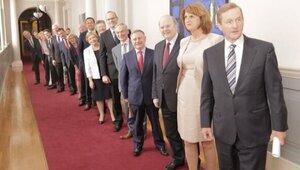 Seriously, it’s not all a real life episode of Love Hate. That’s just a tv show, yeah? He sounds like a clown this newsjustin. Too much RTE and English cop shows. Does he even know why cannabis was originally banned? And the basis for that banning? Probably not. Because he’s ignorant. Some of the most intelligent and hard working people I know indulge. Bankers to engineers to tradesmen. All pay their taxes, love their families and just want to be left in peace. You only live one life, so why should they not do something they enjoy that affects no one else, at all. None of them fund any violent anything. Where he gets this crap from is beyond me. I prefer it to booze. Not that I don’t love a pint but I wouldn’t drink sitting in on my own. I *prefer* to smoke on my own though. You have no basis for this false statement, admit that this wouldn’t be the case if it were legalised but still you want to lock people up who you see as beneath you. People who knowingly fund violent criminals, like the groups murdering each other in the streets of Dublin currently, are, of course, beneath me (and most other reasonable people). Anyone (regardless of class, income, address, etc) who gives money to violent criminals in return for weed or coke or pills, etc are scumbags. I have sympathy for addicts. They have a problem and need and deserve help. I don’t have sympathy for people who just want to get high and are happy to fund Irish criminals and misery in developing countries to get that high. They are scumbags. Ok. What percentage of weed smokers are buying from violent criminals? I’m sure your concern for funding these criminals is genuine so you’ll have some actual facts to back that up. There’s no way you’re pretending to care about violent criminals as an way to advocate against something you find personally distasteful. No way at all. I havent a clue how many. I know violent, organised, criminal drug dealing does exist. So it’s not 0%. What I find “personally distasteful” is people giving money to illegal drug dealers and thereby directly or indirectly funding organised crime. So weed smokers are scumbags for funding organised crime but you have no idea how many are actually doing that. Ok. So you’re making up principles and pretending to care about other people because you find weed ‘icky’. Morally bankrupt. People who buy drugs, not caring who gets hurt as a result of the purchase are morally bankrupt. As are people who try to claim it doesn’t happen. You’d probably be the first to stand up for southeast asian kids exploited by clothing manufacturers and emphasising consumers obligation to do something about it. But when it’s drugs, the problem just doesn’t exist. How convenient. You’re full of human excrement newsjustin. Head to toe. It’s obvious to anyone here you haven’t a clue what you’re talking about. You know nothing about where people procure their herb so you should probably shut up. That’s like 0.1% of weed smokers. When you start calling people who buy nestle and coca cola products scumbags, then you can talk. Until then, you’re a morally bankrupt hypocrite whi pretends to care about people so you can force your personal tastes on everyone. Alright. Nothing to see here. 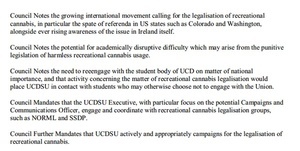 Recreational drug users are not responsible for any criminal activity, either in Ireland or overseas. It’s all just a myth. Correct. It really is a myth you’re pedalling. If you had any proof for your lies, you’d have shown it by now. But you don’t. You just need to make up these lies so it doesn’t look like you’re selfishly forcing your views on the resr of us. Anyone smoked any of that grass/skunk the kids are smoking these days? We’re not talking about a bit of poo hash with bits of plastic in it like back in the day that couldn’t get a sparrow high. This stuff nowadays is bleedin mental, proper incapacitative psychotic stuff. If you were smuggling alcohol would you smuggle beer or spirits? I smoked a bit of grass once.. glanced over at the clock and thought it was moving a bit fast. Like very fast. Got the notion then that I was Dr. fupping Who and was time travelling, but I wanted to stay in this century. Is that a common experience that you turn into Dr. Who after sparkin’ up a fattie? No? 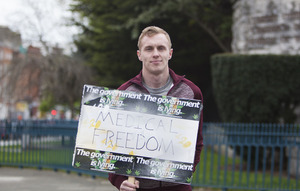 Also, hasn’t legislation already been passed in the Dail earlier this year for medicinal use? It’s very restrictive.. only for adults, for MS, Epilepsy and cancer and you need to show that nothing else worked for you. I’ve never done drugs. I don’t want to do drugs. But I’m fine with choice. But people are dumb and will drive when off their nut. Making it legal will mean more people will drive when high as a high man on high day. People are idiots. Irish people on drugs are more of that plus another bit.